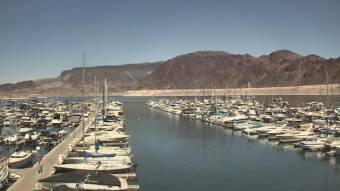 It's 02:05 in the Lake Mead National Recreation Area, USA right now. Lake Mead Marina A nice view over Lake Mead Marina from Lake Mead Cruises. Las Vegas, Nevada: Las Vegas Day School, 41.6 miles away. Las Vegas, Nevada: Las Vegas Springs Preserve, 41.6 miles away. Las Vegas, Nevada: Red Rock Visitor Center, 41.6 miles away. Las Vegas, Nevada: Sierra Vista High School, 41.6 miles away. Las Vegas, Nevada: Wetlands Park (Clark County Parks & Recreation), 41.6 miles away. Las Vegas, Nevada: Red Rock Hotel and Casino, 41.6 miles away. Las Vegas, Nevada: Inspirada Overlook, 41.6 miles away. Las Vegas, Nevada: Las Vegas Strip - The Stratosphere, 41.6 miles away.